A new television ad in the Kansas gubernatorial race hits Republican Kris Kobach for his past comments on state school funding. Democratic state Sen. Laura Kelly is running against Kobach, a fiery conservative backed by President Donald Trump, who says he will cut both spending and taxes and crackdown on immigrants living illegally in Kansas. Kelly hopes to beat him in a red state by luring moderate Republican voters uncomfortable with Kobach’s in-your-face style. In her newest campaign spot, Kelly directly attacks Kobach for what she says is a past comment about education funding in Kansas. 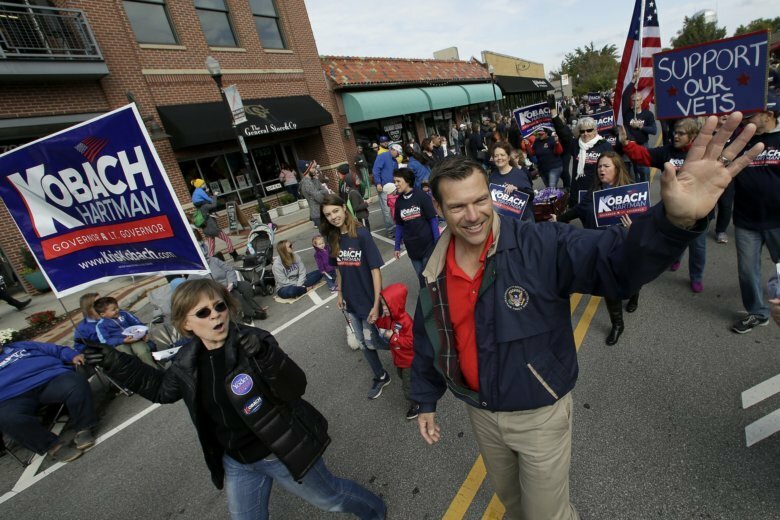 Kobach has asked the ad be pulled from the airwaves, calling it inaccurate. KELLY: “He actually says our schools are overfunded,” says the ad which began running on TV late last month. THE FACTS: Kobach did not actually say that, although he has been critical of how the state funds education and how school districts spend taxpayer money. Kobach opposes a $548 million state education funding increase approved by legislators this year to meet a Kansas Supreme Court mandate. Kansas conservatives and the state Supreme Court have been at odds for years over a provision of the constitution that requires the state to provide “suitable” funding for public schools. Kobach is frustrated by the Legislature’s annual ritual of approving education funding followed by the high court saying the budget is not enough. He says the cycle should stop. He also refers to some school buildings as “crystal palaces ” and complains about the number of administrators employed at some districts. During a debate earlier this year, Kobach said state legislators should stop focusing on the total amount of money spent on schools. The ad stems from an April debate between three Republican gubernatorial candidates, including Kobach. In the ad, the Kelly campaign cites a newspaper article of the event that said Kobach described the schools as overfunded, but does not directly quote him as saying that. During that debate, a moderator asked Kobach how he would balance the different interests of school districts throughout the state. In a nearly three-minute response, Kobach touched on a number of issues, including his plans to make Kansas schools compete for dollars based on student test scores and give students vouchers to move out of failing school districts. While Kobach said at the event that “every school should have the resources it needs” he also added that state lawmakers need to “stop focusing on the total amount of money” spent on schools. Kobach, a graduate of Harvard, Yale and Oxford, then told the audience he didn’t go to a school with up-to-date technology or buildings growing up in Topeka, Kansas.